Can you say rooftop hammock? Our contributing editor scoured Overland Expo West to find the latest in overlanding and vehicle upgrades you need to see. Over the river and through the woods… and up the mountain and across the desert, overlanding requires more than a stout truck. This year’s gathering of adventure-by-tire enthusiasts and manufacturers in Flagstaff, Ariz., showcased gear that makes tromping through the wilds a little more comfortable. 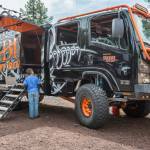 Here are a few of our favorite products from the 2017 Overland Expo West. 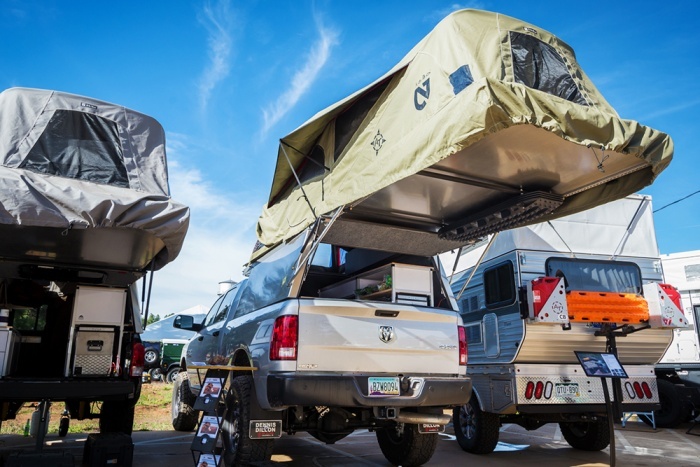 Combine a truck canopy and rooftop tent, add top-notch engineering, quality materials, and impressive ergonomics and you get the AT Habitat. The system was released last year for mid-size trucks like the Tacoma. This year, with 5½- and 6½-foot lengths, it’s available for the full-size truck market. Built to order with a 12-week lead time, you can add options like side entry hatches, vehicle color matching paint, and Goose Gear interior living systems. These plus-size canopy tents retail for about $8,800. The $320 Tembo Tusk Skottle cook system is a pre-seasoned, free-standing grilling dish. It’s great for stir-frying in the outback. 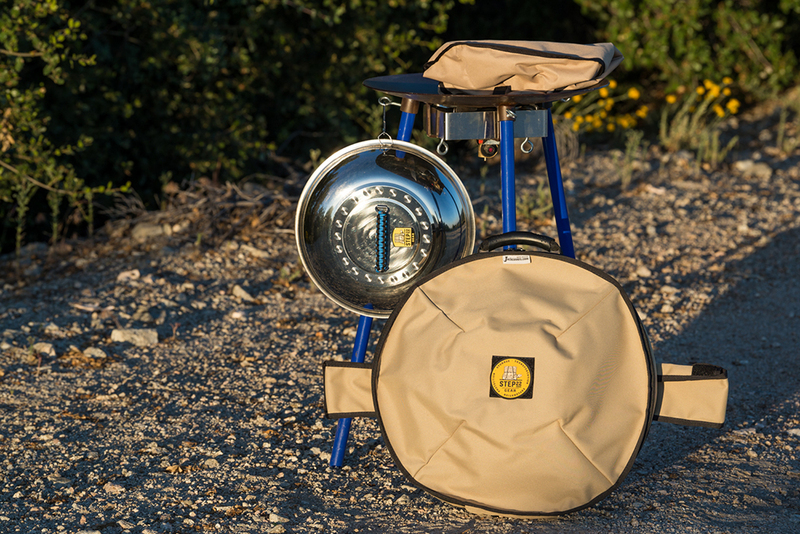 Now, STEP 22 Gear elevates the cooking kit with a comfortable carrying system, paracord handled lid (in three sizes), an all-weather cover, and a burner windshield — everything necessary besides the propane. Bonus, all STEP 22 Gear soft-goods are American made. TrailNest offers the next-best thing for your roof: Rooftop lounging. 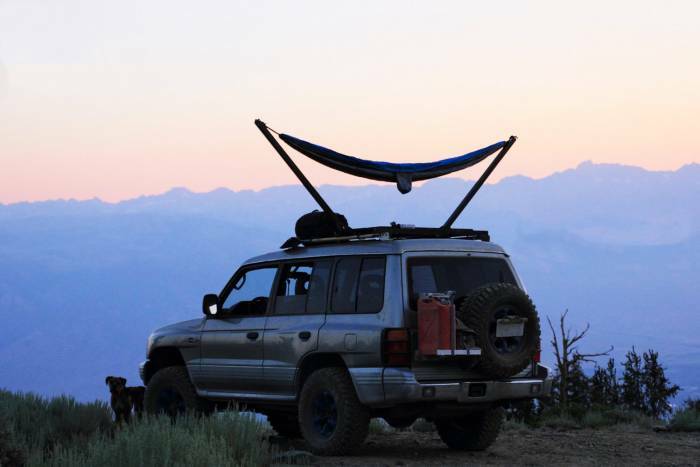 We’ve tried rooftop tents and love them, but they’re expensive and heavy. 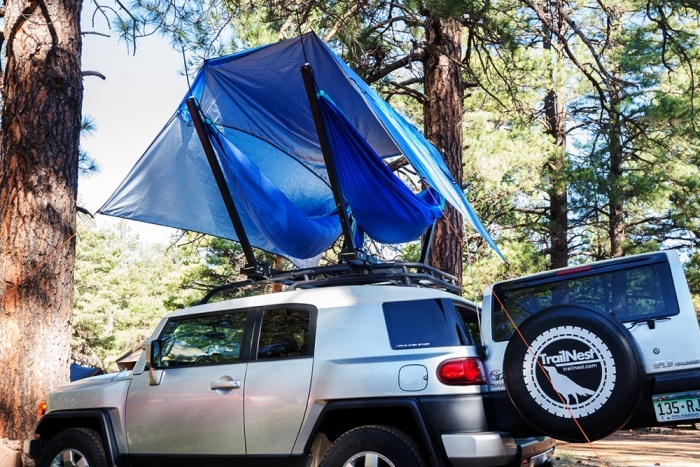 The $350 TrailNest rooftop hammock stand allows you to sleep and hang atop your vehicle in style. Each stand weighs 40 lbs., supports up to 250 lbs., and also doubles as a ground stand. The units fold down when not in use, and they pair for two-person rooftop relaxation. 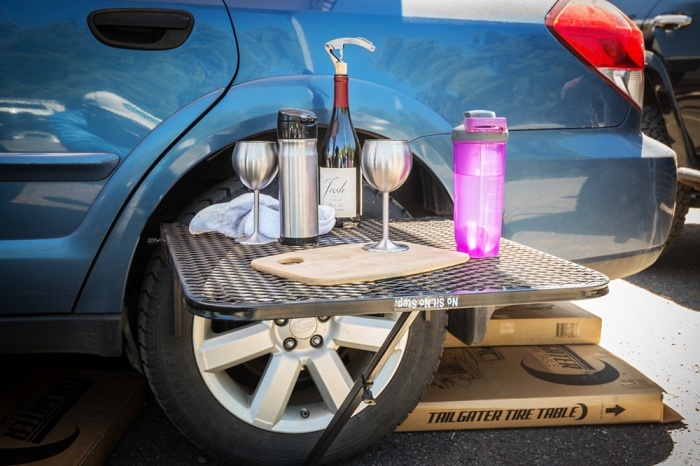 The TailGator uses your vehicle’s tire as the main support for a camp table. It weighs 13 lbs. and all the parts fold completely flat for storage. It is adjustable for tires’ different heights and widths and provides a 29” x 23” table surface. The $140 TailGator sets up and breaks down quickly, and it feels plenty sturdy in use, too. 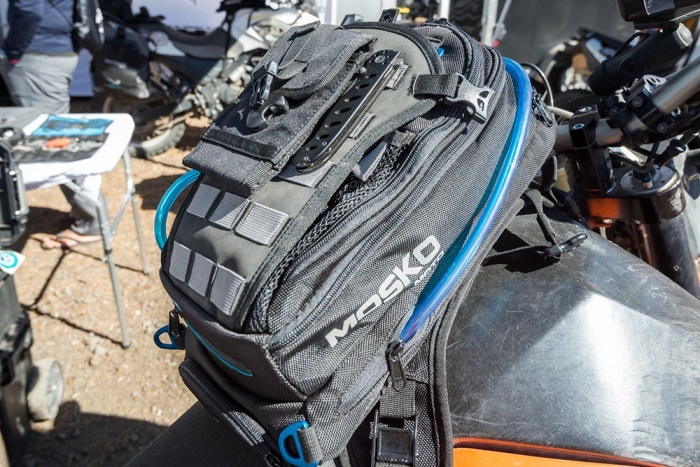 Mosko Moto redefined the adventure-motorcycle tank bag. The $190 Nomad pack has several great features in a small package. My favorites were the deployable backpack straps, hydration compatibility, dedicated Garmin inReach pocket, and a map pocket. It accommodates medium-size DSLR cameras in its clamshell-style, layered organization system, making it much quicker to stop and grab that amazing photo you might otherwise miss. The Larry Alert is a small portable security system that allows you to monitor your vehicle, campsite, and bicycle from afar. 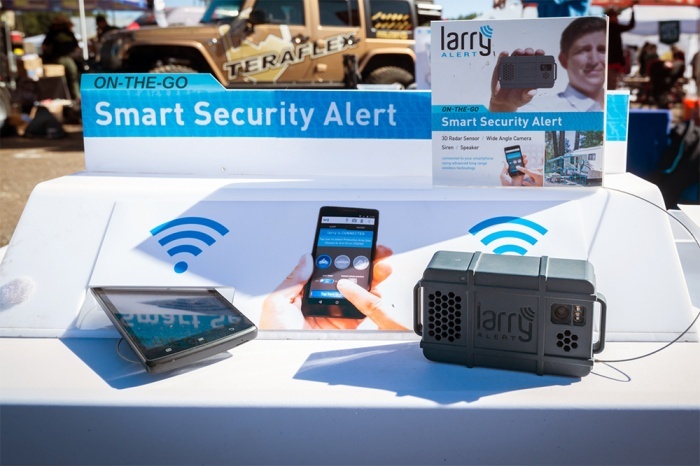 It uses radar and camera technology to keep track of your belongings and alerts you via a smartphone app when there is activity around your things. It uses radar and camera technology to keep track of your belongings and alerts you via a smartphone app when there is activity around your things. The $149 device can even transmit your voice through an integrated speaker in real time, letting you interact with those messing with your stuff.